﻿ Binomo Review - Start Trading from Just $10! Binomo Review. Start trading from just $10! Whether you are a beginner to binary options trading and making a choice on that first broker or already have some experience and are either not entirely satisfied with your current broker or simply interested to compare, it makes sense to put in some research time. There are now a great many binary options brokers on the market. Many of them are not particularly distinct from each other and often use one of 2 or 3 popular white label trading platforms and others have a greater degree of uniqueness to the service and product they provide. Because there are differences in terms of both the trading options available, minimum value of positions and deposits and trading platforms, it is important to make sure a broker offers what you need before opening an account and making a deposit. Customer services and security are also of course primary considerations. In our review section we’ve covered and summarised all of the most important information on as many of the binary options brokers currently on the market as possible. We hope this will provide a valuable resource when it comes to helping you select the best broker for your requirements! In this review we take a look at Binomo. On the market since 2014, the Binomo brand belongs to Seychelles-registered holding Tiburon Corporation with payment services operated out of Cyprus by Stagord Resources. The ownership of the broker appears to be Russian and Binomo first established itself as a binary options brokerage brand in Eastern Europe before developing a broader international market in Western Europe and Asia. Although Binomo does have a registration with voluntary opt-in organisation CROFR, the broker is not yet regulated by a government-controlled financial services regulatory body though the website does claim that CYSEC regulation is ‘pending’. Despite the lack of officially recognised regulation, Binomo’s approach to clients has been recognised by a number of awards. These include ‘Best Broker for South Eastern Europe’ at the 2016 IAIR Awards and ‘Best Broker for Beginners’ at the 2015 Forex Expo Awards. Binomo traders can choose from a solid range of assets across indices, equities, currencies and commodities. Overall there are over 70 choices, which while not the deepest range available on the binary options market, will be more than enough for the vast majority of traders. Binomo has a range of promotions and bonuses that traders can take advantage of. New account holders are offered a deposit match on their first deposit. This varies from 20% up to 100% of the value of the initial deposit, with larger deposits attracting the larger bonus percentage. Deposit match bonuses are also often opened for several days at a time to encourage existing account holders to top up their trading funds if they are running low. One drawback to accepting bonuses is that the trader must then trade the value of the bonus at least 35 times before being able to make subsequent cash withdrawals from their account. Additional promotions include occasional free-to-enter trading tournaments for beginners that can have cash prizes of up to $500. There are also tournaments for more experienced traders that have a buy-in, where prizes funds can reach $10,000+. 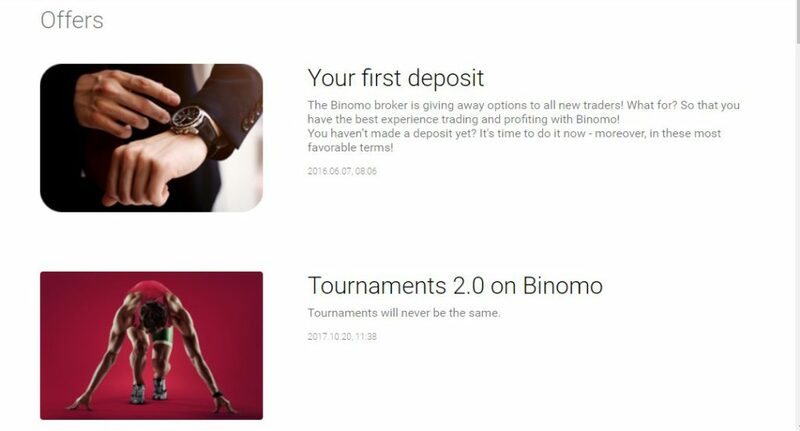 Rather than opting for one of the usual white label trading platforms most common for binary options brokers, Binomo have taken the admirable decision to go it alone and develop their own proprietary platform. The top white label platforms are high quality products but at the same time it is refreshing to see something a little different. Binomo’s platform takes a minimalist approach and has cut out all but the necessary functionality required to place binary options trades. This will appeal to many traders who value ease of trading above all of the add-ons some platforms have, which can clutter the screen and detract from core usability. Binomo doesn’t offer the alternative binary options formats that have become standard with many brokers, such as Ladder and One Touch options. However, the statistics show that these are only popular with a relatively small number of traders so most won’t miss their absence. 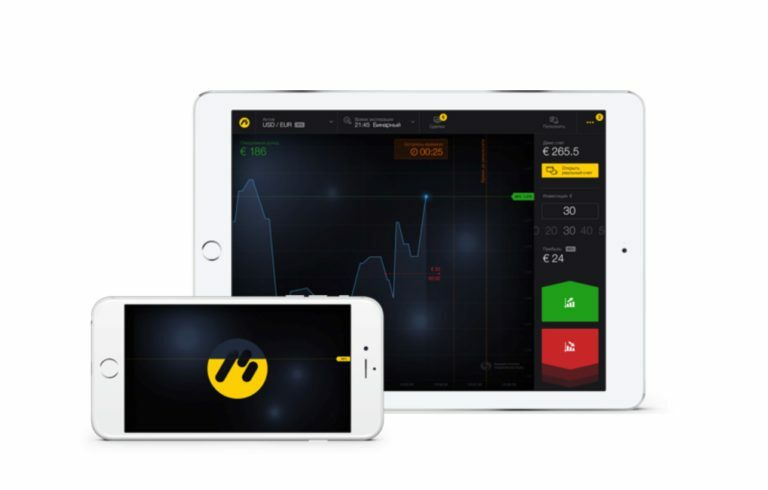 Apps versions of the trading platform are available for Android and iOS mobile devices and have been built to a very high quality. The general simplicity of the trading platform means it lends itself naturally to a smaller screen format and there is also no noticeable time lag when placing trades, which can sometime be an issue with trading platforms on mobile devices. Desktop and mobile apps also sync so traders can open a trade on their laptop or desktop and then subsequently monitor and manage it on the go. There are no fees attached to holding an account and generally using the Binomo trading platform. Charges that do exist are a 10% levy on withdrawals made before the value of the deposited balance has been traded at least twice and that the broker will close an account and claim the remaining balance in it after 6 months of inactivity. No charges are applied to standard withdrawals, which many brokers do apply. Additional trading features are limited, with the Binomo platform sticking to the standard binary options but one major advantage to the platform is that the starting value for options is only $/€1. As mentioned earlier, one major advantage that Binomo boasts is that accounts can be opened with a minimum balance of just $10, or equivalent in another of the base currencies accepted. The minimum withdrawal value is also $10 and no charges are applied to withdrawals. Processing time for withdrawals is given as being within 3 working days. Both deposits and withdrawals are made by debit and credit card with Visa, Mastercard and Maestro all accepted. One drawback is that Binomo does not currently support bank transfers or e-payment providers for deposits and withdrawals. Customer support is offered via a variety of communications channels including Skype, chat, telephone and email, with 9 different languages also supported, including several Asian languages such as Mandarin, Thai and Indonesian in addition to the usual major European languages. 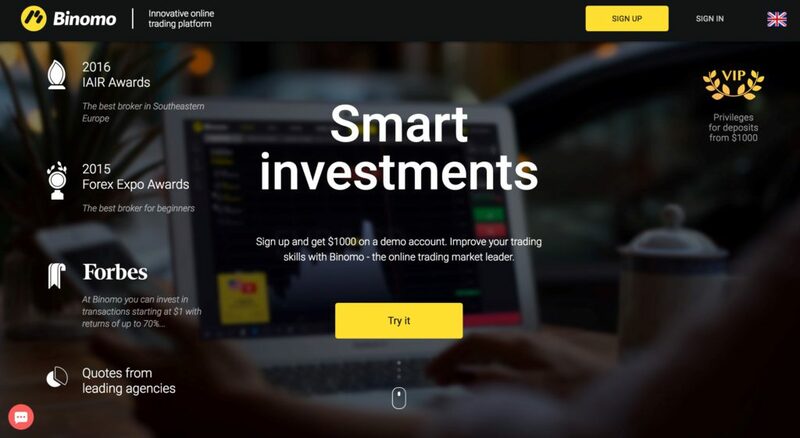 Binomo doesn’t provide traders with many extra features and resources but there are a number of tutorials on different trading strategies available as well as unlimited access to a demo version of the trading platform. Binomo’s major strengths are the simplicity and accessibility of its trading platform and the fact that it offers minimum deposit and withdrawals levels far below those set by most of its competitors. $1 binary options positions are also much lower and will be particularly attractive for beginners still learning how to trade effectively and focused on keeping potential losses to a minimum. Customer service response times and helpfulness have been criticised and is obviously an area where improvements can be made. Otherwise, CYSEC regulation moving from ‘pending’ to actual will be a significant step in the right direction for Binomo. Is Binomo a good binary options broker for beginners? Yes. Binomo’s trading platform is very easy to use and is perfect for beginners. A minimum deposit level of $10 and minimum binary option stake of $1 is also perfect for beginners.